As much as I love the calmer pace and greater flexibility of summer, I was very happy to be back in the classroom today. My days are typically spent staring at the computer screen a lot and though I do interact with colleagues in person and through various media, there’s something very stimulating and satisfying that happens in the classroom that doesn’t happen elsewhere, at least for me. There were a lot of firsts in this inaugural seminar of LLCU-602: New Approaches to Scholarship in the Digital Humanities: first fully-fledged digital humanities course at McGill; first class for me to teach since my arrival at McGill; first course I’ve taught where a colleague is auditing it; etc… Below is the syllabus for the course, a humble contribution to the ever growing number of digital humanities syllabi out there. This syllabus may be of interest for the organization of the topics & assessments – unfortunately the readings aren’t included in this view, but I’ll post an updated version later in the term. The Humanities are rich from centuries of intellectual practices and millennia of historical records and thought. The Digital Humanities seek to engage with those traditions while also exploring the potential for using digital technologies to extend modes of humanistic inquiry. What new interpretations might be spawned when bits of cultural data can be infinitely rearranged into representations unimaginable in analogue form? What new arguments might be proposed when we can instantly ask questions at the unprecedented scale of millions of books? Through a mix of seminar discussions, hands-on tutorials, and project-based work, this course will provide students with theoretical and practical foundations for working in the Digital Humanities, covering topics such as digitization, encoding, analysis, and visualization. No technical background is required. Week 1: What are the Humanities? What is Digital? What are the Digital Humanities? Please note that further details, including readings, will be provided via the course management system. There are no bookstore purchases to be made for this course. Blog (30%): Students will write at least one blog entry per week that contains at least one paragraph of reflection on the week’s readings and at least one paragraph on an additional relevant reading that the student has found. Students are also encouraged to write on other topics, such as reflections on the past week’s seminar, thoughts on relevant news articles, ideas about possible projects, etc. Students should adopt the tone of academic blog (including references as needed) and the entries will be assessed based on the quality of the ideas and expression. Presentation (15%): Students will choose a topic of interest from the course schedule and create a presentation. Presentations must make significant use of a digital technology, but may not use slideware (PowerPoint, Keynote, Impress, etc.). Alternatives include Prezi, Xtranormal, and multimedia videos. Students will be assessed on the quality and usefulness of the information presented, as well as the effectiveness of the use of the chosen communication platform. References should be included. Participation (10%): Student attendance and participation in seminar discussions is a crucial component of the class. This course is a mix of theory and practice – students are expected to attend and participate thoughtfully and respectfully in the seminar meetings. If possible, students should bring a laptop to class to participate in the hands-on components. The Course Management System will be used extensively in this class to post notes, important date changes, assignment descriptions, etc. You are responsible for checking the site regularly (at least twice a week) for any changes or updates. In accord with McGill University’s Charter of Students’ Rights, you may submit in English or in French any written work that is to be graded. Please be aware that impeccable grammar is required whether you choose to write in French or in English. 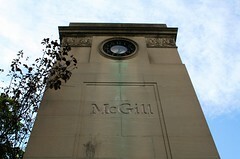 McGill University values academic integrity. Therefore all students must understand the meaning and consequences of cheating, plagiarism and other academic offences under the Code of Student Conduct and Disciplinary Procedures (see www.mcgill.ca/students/srr/honest/ for more information). Please note that multimedia objects (images, video, etc.) as well as programming code are subject to the same standards of academic integrity. Hi Stéfan — just wanted to let you know that I’ve also added your course to the DH Syllabi listing in the CUNY Digital Humanities Research Guide. Looks like a great course! Thanks Matt. I’m not sure I would have thought to organize the syllabi by year, but that certainly draws attention to how fast things can change.